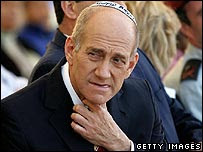 Israeli Prime Minister Ehud Olmert is under fire from Israeli leaders who have concluded he took them to war with Lebanon “hastily” and without a solid plan. Retired judge Eliahu Winograd presented the findings of the six-month investigation at a news conference. He said the decision to launch the war without a well thought-out plan showed “a severe failure in judgment, responsibility and caution”. The aims of the war – to crush Hezbollah and force it to hand back two Israeli troops captured in a deadly cross-border raid – were “overly ambitious and impossible to achieve”, Mr Winograd said. Some 1,200 Lebanese, mostly civilians, and 160 Israelis, mostly soldiers, were killed in the 34-day conflict, while the two captured soldiers remain in captivity. Israel was almost universally criticized for the invasion, though some right-wing observers still defend the action. US officials, like former UN ambassador John Bolton, rushed additional weapons to the Israeli army, blocked an attempted cease fire and prolonged the conflict. For their part, those US officials say they are “damned proud of what they did“. By admitting that misconduct and failures in judgment occurred, the Israeli government takes a definitive first step toward correcting the errors of the attack on Lebanon. Wouldn’t it be nice if the US learned something from Israel here? This is a complicated issue for me. Nadir opposed this action and knew with 100% certainty that it was wrong 5 nano seconds after it began, before any facts of the action emerged; in Nadir’s view, Israel is wrong to fire or cross into Lebanon, any resulting military action constitutes a human rights violation, and any official rationale from Israel’s government constitutes a falsehood. Furthermore, Nadir believes that Hezbollah’s attacks on Israel’s military and civilians represents a just struggle to oust a foreign colonial, racist occupying power whose actions resemble those of the Nazi’s attempts to conquer an entire region and exterminate members of specified racial groups. My view is the opposite: Israel’s existence is no less “legitimate” than that of any government that has ever existed in the history of humankind, from the tyrannical brutes who created ancient Egypt, Babylon, Greece, Inca, Aztec, and Rome, to any government you can name today. But more than any of those ancient governments, and more so than any nation within a thousand miles of Israel’s borders today, Israel’s government derives of its residents, who enjoy personal freedoms and rights and own their own bodies and ideas. Until the people who devote themselves to, and successfully create, such a government for themselves, I oppose any violent action from such people against Israel, and in general I support violent counter-attacks from Israel against such people. Do I support the way that Israel conducted this particular counter-attack? I am not sure.